Anna Catherine Kreutzberger he was born on ____, 1751. Henry was born in the same log cabin as his older brother and sister, in the old Frederick Town community but, unlike his brother George and sister Maria Elizabeth, his birth place would be listed as Winchester, Frederick Co Va. because the City of Winchester including Frederick Town was legally established and renamed in 1749 two years before his birth. 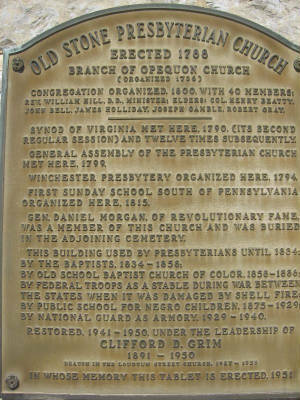 Although His records would be filed in Frederick Co. because Winchester's records did not start until 1790. His father had just bought 381 acres but, at the time of Henry's birth he would have had no time to clear and build on it. 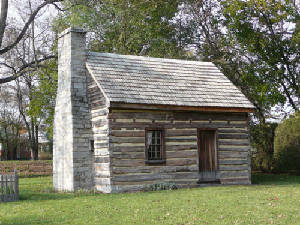 Therefore; we know from his fathers story that Henry was born in a German style log cabin like the one pictured here, located on lot #7 in the original town of Frederick Town Va.
By 1753 The Indian raids had become so bad that the areas west of Winchester had been mostly abandon, Hampshire County was formed from the western part of Frederick Co and part of Augusta Co in 1753 but, the area was considered so unsafe that it was not established until 1757. Thus any records of this period were probably still in Frederick Co. 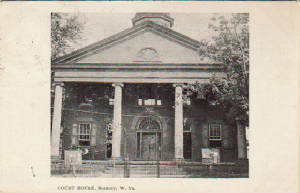 The county's first courthouse was constructed in Romney in 1833, and was distroyed by fire in 1921 along with many of its records. In 1754 Henry was three years old when the French and Indian War broke out. Many people in the area around him were being killed and their homes burned during the some times daily Indian raids. No doubt Henry's house and the town of Winchester was a very vulnerable place, because the office of George Washington, the main leader of the militia, was just three blocks down the street from his home. Besides being a farmer Henry's father was also a tavern owner. During the war hundreds of soldiers camped in the open areas on the out skirts of town, called the commons. No doubt Henry and his brother and sister seen much of the roughness and drunkenness of these soldiers, because it was so bad that George Washington sent out orders that the tavern owners could only provide a limited amount of liquor to each person or they would face harsh consequences and that any soldier caught drunk would receive 50 lashes without the benefit of a court martial. It was also ordered that Henry's father's and two others were the only taverns that any soldier was allowed to enter or set down in without a very good reason. By 1755 the Indian raids were getting so bad that Col. George Washington ordered the construction of Ft. Loudon to start on the east end of Winchester. In 1756 Ft. Loudon was finished and no doubt Henry, now five years old, spent many nights inside the walls of the fort. In April 1756 Though we find no record of any of Henry's family having it , we can only imagine the care they took to limit their contact with the public, because a great epidemic of Small Pox had entered the Winchester area and many died from it. This must have been extremely hard, being that they were rushed into the fort with all of the other town's people and soldiers, each time an Indian raid occured. On august 28, 1756 Henry and his family was rushed into Fort Loudon because the Indian raids were so bad that it was reported to Col. Washington that there was only two families left in the area from Frederick, Md. to Winchester, Va. the rest had abandoned their home for safety. On December 7, 1757 Henry's Grandmother Regula (Herter) Brinker died in Lower Saucon Twsp. Northampton Co. Pa.
On ___, 1758 Henry's sister Mildred Brinker was born. Like Henry she was born in Winchester but, her records would have been filed in Frederick Co. because Winchester records did not start until 1790. From July until September 1758, at the age of seven Henry, his mother and older brother and sister were left to tend the tavern and farm, while his father marched with Col. George Washington to the battle of Ft. Dequesnse. 1759, Henry's father purchased 381 acres in 1750 and developed his farm just two miles from the Hopewell Meeting House. We know from many records that this family attended meetings there. The following is a quote from the history of their meetings. Frederick Co. records begin 1744 while Winchester's began 1790 and they are much smaller in volume as the town size did not change from 1754 until 1905. Land and probate records for Winchester begin 1790, Marriage bonds for Winchester in 1790 and some marriage licenses for period 1843-1855. There are also a few birth and death records from 1855 to 1870. Unlike Frederick records, many of these records for Winchester were destroyed during the Civil War. It is highly possible that Henry's birth records were destroyed in the fire of 1759. In 1763 Henry's older brother George left home, at the age of 17, to serve a four year apprenticeship, under Adam Haymaker one of the most famous gun makers of the time. In late 1763 the French and Indian War was coming to a close and life was beginning to get back to normal, though there were a few hostile Indians who randomly raided homes in the area. February 1764, Henry's uncle, Abraham Brinker died in Lower Saucon Twsp. Northampton Co. Va. Two months later on March 12, 1764 Henry's grand father Andreas Brinker died in Lower Saucon Twsp. Northampton Co. Va. In 1764 at the age of 13, the Virginia Early Census show Henry living in Winchester Twsp. Author's Notes: His father purchased 381 acres just a few months before Henry was born, which would have been 13 years earlier, giving him plenty of time to develop his farm. Thus this record stating (Winchester Twsp.) would most likely be his father's farm NE of Winchester. In August 1772 Lt. Henry's father, Henry Brinker, died in Hampshire Co. Va.
We find no record of Henry's training but, his brother George finished his apprenticeship in 1766 and we find many served apprenticeship under him. Thus it is very possible that he trained Henry. In 1781 Henry's Grand father George Michael Laubinger died in Winchester, Frederick Co. Va. He was buried in the old Lutheran Church Cemetery in Winchester, Va.
July 1782 Lt. Henry Brinker deployed with Col. Wilson to Tygart Valley to battle Indians. August 7, 1786, A letter from George Washington to Commanding Officers on the frontier, dated 7 Aug. 1786, Winchester, VA, indicates that Henry Brinker was on the approved list for selling liquor to soldiers of the VA Militia. This author is trying to prove his theory; that right here is were Charles Brinker 1790 was born. Charles Brinker and Reachel Bowen has been a brick wall for genealogist for many years. December 4, 1801, Henry's mother Anna Catherine (Kreutzburger) Brinker died in Winchester, Frederick Co. Va. She is buried in the old Lutheran Cemetery in Winchester, Va.
March 7, 1810 Henry's mother-in-law Barbara (Painter) Laubinger died in Frederick Co. Va. She is buried in the old Lutheran Church Cemetery in Winchester, Va. Authors Notes: This author firmly believes that Henry is the father of Charles Brinker 1790 but must first prove this theory, This census shows Henry to have; One female 10-15 yrs old living in the household, Charles would have been 20 yrs old and possibly gone from home ???? 1830 census was enumerated June 1, 1830 this census is the first record we find of Charles Brinker and Rachael Bowen in Decatur Co. Indiana. Charles would have been 40 years old. 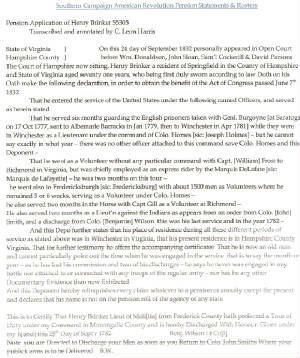 According to his application for pension Henry was living in Springfield, Hampshire Co Va. on September 24, 1832. This is a part of Henry's Will written December 13, 1837: "To John Brady for use and benefit of Hannah Laubringer, wife of George, 'during her coverture" Exec. John Brady second Christopher Heiskell. Witness: David Kinnison, R. G. Piper, James M. Brady. March 3, 1838, Henry Died in Springfield, Hampshire Co Va. at the age of 87. Authors Notes: West Virginia became a state on June 20, 1863, 91 years after Henry's death. Thus all of Henry's records should be listed as Frederick and Hampshire Co. Virginia. This relationship began early in the development of Winchester. Henry Brinker and George Michael Laubinger must have been very close friends, they are found working together from the time they settled in the Opequon area until their deaths in Winchester. We find both of their names together as witnesses on many land transactions, wills, and legal records throughout Frederick and Hampshire Counties. Both of their names are today still engraved in the cornerstone of the Old Lutheran Church as the founders and builders of the original church. They both served under Col. George Washington in the Frederick Co. Militia during the French and Indian War. On every voters list we find they both voted for the same candidates. Henry’s son Lt. Henry Brinker 1751 married George’s daughter Catherine Laubinger. Lt. Henry Brinker 1751, left provisions in his Will to care for George’s wife Hannah. The 1810 census show Lt. Henry Brinker and his brother-in-law Michael Laubinger living four doors from each other in Hampshire Co. Va. These two families were first seen together in Bucks Co Pa. were Andreas Brinker and Regula (Herter) Brinker Settled in 1739. Moses was born 1674 in Carmarthin, Wales. He emigrated from Wales to Philadelphia, Pa. about 1698 to Guinned Township, Chester Co., PA were he bought 10,000 acres of land. He married Rebecca Reece in 1703 in Bucks Co Pa. In 1732, they moved to Rockbridge County, VA. He died in 1760 at the age of 86 in Montgomery Co. PA. Rebecca died April 1, 1780 at the age of 104 in Chester, Pa.
Their one son Henry Bowen Sr. was well known to the Brinker family in Frederick Co Va.
Henry Sr. purchased one half of a 448 acre parcel in Frederick County, Virginia, on January 30, 1743 from John Littler. The other half was purchased on the same day by Thomas Rees, Henry's son-in-law. 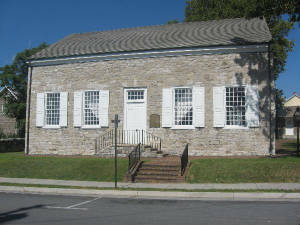 Henry and Jane (Carter) Bowen were Quakers, attending the Hopewell Meeting House near Wincester, Frederick County, Virginia. In 1754 Henry Bowen Sr. sold his property in Frederick Co Va. to his son Henry Bowen Jr. Soon after this transaction Henry Sr. died. Henry Bowen Jr. was born 1715 in Chester Co Pa. He married Anna Moon in Frederick Co. Va. She was born 1723 in Frederick Co. Va. and died at Apple Pie Ridge in Frederick Co. Va.
Born: May 3, 1742 at Apple Pie Ridge, Frederick Co. Va.
Died: May 19, 1827 at Jefferson, Greene Co. Pa.
Born: 1758 in Winchester, Frederick Co. Pa.
Born: 1762 in Winchester, Frederick Co. Va.
Died: ___ in Frederick Co. Va.
Born: April 3, 1742 in Frederick Co. Va.
Died: 1825 in Green Co. Pa.
Born: 1748 in Winchester, Frederick Co. Va.
Born: 1745 in Winchester, Frederick Co. Va.
Born: 1750 in Frederick Co. Va.
Born: Feb. 1, 1752 in Frederick Co. Va.
Died: March 18, 1828 in Washington Co. Pa.
Born: 1755 in Winchester, Frederick Co. Va.
Died: 1824 in Green Co. Pa.
Born: 1756 in Frederick Co. Va.
Died: 1819 in Frederick Co. Va.
Here-in may be the family of Rachael Bowen ?? 1782 Frederick Co. Va. Census shows Henry Bowen 7 White persons and 5 Black persons. This house was constructed of locally quarried fieldstone for the family of Richard and Charlotte Sloan about 1790. 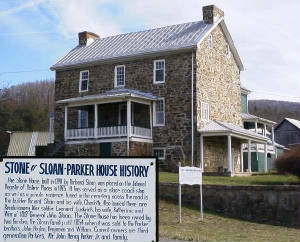 The family who ran a weaving business owned the home until 1854 when it was sold to the Parker brothers. The house is located on Rt 50 west of Romney. Ridgedale the home of the George W. Washington family. 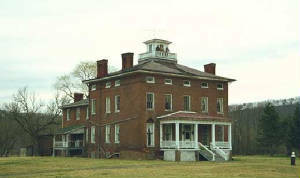 Ridgedale was built about 1850 by George William Washington who had become a resident of Hampshire County in 1834 or earlier. The house was built on part of 700 acres devised in 1817 to Sarah "Sally" A. Wight and her siblings by their grandfather, Maj. Robert Lockhart first of Lancaster County, PA and later of Frederick County, VA. Sarah married George W. Washington sometime around 1830. George and Sally lived at Ridgedale and raised at least nine children, one of whom, John, died in the Civil War. George died in 1876 and with his wife and several family members is buried in Indian Mound Cemetery in Romney. One son, Edward, who married Susan Ann Taylor and lived at Ferndale several miles down river in a house built in 1834 by Susan's father, William Taylor. Other children married into the the Pancake, Inskeep and Rees families. The ancestry of George William Washington is uncertain, but it is assumed that he is a distant cousin of President George Washington.